Product designer and “Chief Executive Human” Chris Miksovsky started humangear to up the fun and functionality in everyday items. Their novel approach has caught people’s attention and won awards. 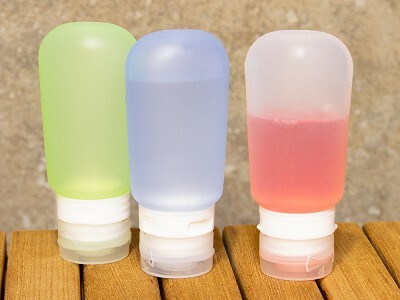 Quirky travel container GoToob is made from soft, easy-to-squeeze silicone. Put shampoo, conditioner, or soap inside and you can access every last drop. To remember which tube holds what, just write it on the space provided. 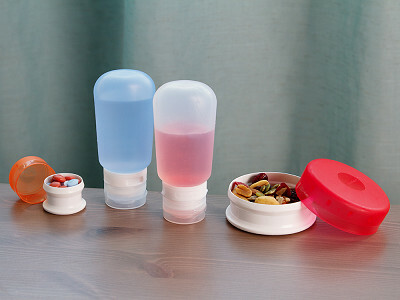 If you want to carry non-liquid essentials like pills, snacks, and vitamins, toss them in a GoTubb. This transparent container opens with one hand. It has a place for labeling the contents, too. And humangear even has an effective, environmentally friendly approach to on-the-go eating—GoBites, a personal set of reusable utensils. At school, work, camping, or anywhere else, these sturdy utensils stand up to food like real flatware. No more broken plastic forks and knives that you toss after one use. With their inquisitive way of reinventing the ordinary, humangear is happily making daily tasks less of a chore. 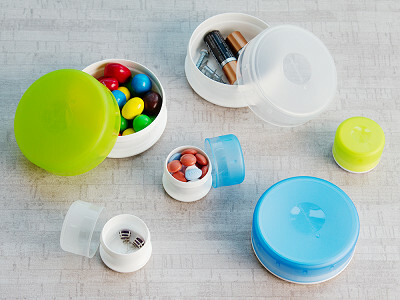 Put pills, vitamins, earbuds, or anything else in GoTubb, a handy container that opens and closes with just one hand. Hello! I'm Annaliese from the Daily Grommet Team, filling in for Chris Miksovsky, founder of humangear. Unfortunately Chris is unable to be with us today, but I can answer any questions you may have. How big is the smallest pill box? Looks like the one that comes with the blue cup? I have been looking for a very thin pill box to carry with me. Can you give me dimensions? @Samantha Walsh This information can always be found in the details tab which is located right next to the story tab below the video. The pillbox inside the GoCup is about 1/2in D x 1 3/4in H. It can be carried separate from the GoCup. We also offer the GoTubbs 36mm D x 26mm H (1 1/4in D x 1in H). My sister got me these pill containers for Christmas and I love them! I needed a container that was roomy enough to hold those 'horse pill-sized' medications and they fit! This is my favorite pill container yet. These look really good, but the pictures are small, and the descriptions are too brief. Is there a site I could go to to find out more? @Lee Carson For greater detail, you can always look under the video tab on the "details" tab and then click on the pictures and they will become larger. When I purchased these for a trip I took last year, the suction cups didn't hold, and they were the main reason I purchased them. I am not impressed, unfortunately. @ LeAnn We don't want you to be unhappy with a Grommet purchase, so if you purchased this from us, please contact our customer support team; they will be happy to help you with a resolution. Thank you for letting us know. Product designer and “Chief Executive Human” Chris Miksovsky started humangear to up the fun and functionality in everyday items. Their novel approach has caught people’s attention and won awards. 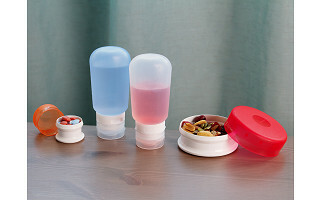 Quirky travel container GoToob is made from soft, easy-to-squeeze silicone. Put shampoo, conditioner, or soap inside and you can access every last drop. To remember which tube holds what, just write it on the space provided. If you want to carry non-liquid essentials like pills, snacks, and vitamins, toss them in a GoTubb. This transparent container opens with one hand. It has a place for labeling the contents, too. 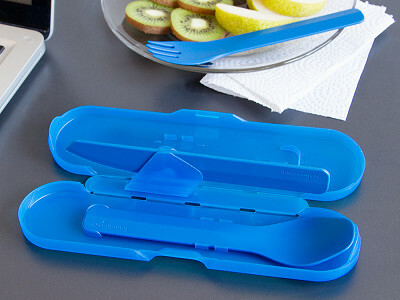 And humangear even has an effective, environmentally friendly approach to on-the-go eating—GoBites, a personal set of reusable utensils. At school, work, camping, or anywhere else, these sturdy utensils stand up to food like real flatware. No more broken plastic forks and knives that you toss after one use.